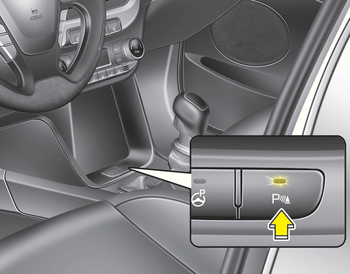 • This system activates when the parking assist system button is pressed with the ignition switch ON. The indicator of the parking assist system button turns on automatically and activates the parking assist system when you shift the gear to the R(Reverse) position or press the SPAS button. It will turn off automatically when you drive above 40 km/h(24.8 mph) except in the case when the parking assist system button is pressed with the ignition switch ON. The indicator of the parking assist system button turns on automatically and activates the parking assist system when you shift the gear to the R(Reverse) position or press the SPAS button. It will turn off automatically when you drive above 40 km/h(24.8 mph). If the vehicle speed is above 10km/h (6.2 mph), the parking assist system will not operate. The sensing distance while moving forward is approximately 100 cm (39.4 in.) when you are driving less than 10 km/h (6.2 mph). It may not operate if it’s distance from the object is already less than approximately 25 cm when the system is ON.